When Estella Camelion’s husband installed a security camera in the kitchen window of their rural 1901 rural Alabama farmhouse, they expected to see the playful habits of free-roaming wildlife, the abundant fruit trees and flowers of their widespread acreage cycling through seasonal changes, and the occasional friendly neighbor stepping on to their porch for a bit of coffee and conversation. In the evenings, Estella — an accomplished self-taught artist – began sipping her evening tea in front of the camera’s monitor. In these twilight hours, what she saw on the monitor astounded her. As the sun went down, mysterious visitors appeared, bearing inspiring messages about our Earth and our humanity. They sat for portraits, telling their stories. Among them: long-gone Native Americans. Angels. Rainbow People. Healers. Star people. Spirit mothers. Earth messengers. Teachers from other realms. As she began drawing them, they kept coming, sharing their guidance, their concerns, their hopes, their pain and their yearning for the people of this Earth to listen to and embrace their messages. Camelion portrays her subjects with intricate details of orbs, webs, and asymmetrical shapes; vibrant colors and powerful shading; and profound symbolism and soulful resonance that give their portraits both a life-like and otherworldly presence. These works are collected in “Kitchen Window People, Camelion’s first book of her astonishing collection of art. “Kitchen Window People” is a book of few words. The art tells the story, and more importantly, the subjects of the portraits transcend words with their profound messages. This is a book you can walk through. Listen to. Explore. Absorb. When the book ends, the subjects live on — and they stay with you. 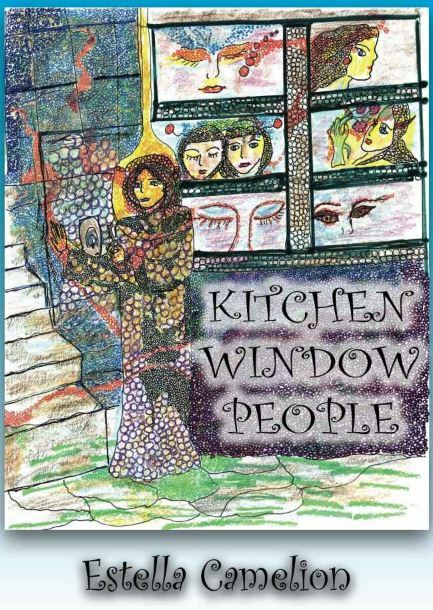 Kitchen Window People is now available on Amazon. To order, visit http://tinyurl.com/ljesjab. FEATURED AT THE 2014 STAR KNOWLEDGE CONFERENCE IN NASHVILLE!